A camera and /or video camera. A ruler or tape measure, or other scale indicator. The area around the prints and the prints themselves should be gently cleaned using the toouthbrush. Take care not to damage the impression. The prints should be photographed, and if possible videoed. A sketch can also be useful. Then measure the length, width and depth of the prints. Remember to add a rular, tape measure, or other size marker such as a coin when you photograph the prints. Press the cardboard or plastic strip into the ground to form a circle around the print. Secure the strip with a paper clip. Then mix the plaster of Paris and water to a thin ceamy paste and pour it slowly into the print, avoiding bubbles. Let the cast for approximately 30 minutes, then carefully lift the print and cardboard/plastic strip. Wrap it carefully in newspaper and place it in a plastic bag for transortation. Allow the cast to set for 24 hours before gently brushing away any remaining earth with a toothbrush. Identification of the prints is not always straighforward but some guidelines are included here. One of the biggest difficulties is in preparing the correct consistency of Plaster of Paris so that there are no air bubbles and fine detail can be seen. The plaster should be of the consistency of condensed milk. Always add the plaster to water and prepare enough to cover the highest part of the track by about 15 milimetres. Although snow can give the best tracks, because the plaster of Paris gives out heat as it sets, good casts are impossible to obtain. Sand and soft silt also pose problems. In these cases, good clear photographs are the best method of identification. Once the plaster has set, most of the soil can be removed, but detailed cleaning should be left until the cast is taken home, when it will be completely set. Newspaper makes a good transport wrapping. Casts can be cleaned with a soft brush and the details may be coloured. They should be clearly labelled with the location, date and a grid reference in possible. Rather than taking a cast (which is fiddly and time consuming) it is very simple just to lay a sheet of acetate over a track and trace the outline, this will provide a lot of information and detail if done reasonably carefully. 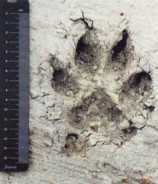 Detailed analysis of such data has regularly been used for differentiating dog from cougar tracks in cougar surveys in the USA. I've just been reading the instructions by Chris on how to make a plaster cast and would like to suggest the following idea which I frequently used when carrying out examinations at crime scenes. Probably the cast that gives the most problem is the one left in snow. As Chris rightly states the plaster of Paris gives out heat as it sets often distorting the shape. My advice is to photograph or sketch the track first then immediately before pouring in the plaster, give the print a light spray of hair spray. In this way I was able to make perfect casts which stood up to the ultimate tests in the Criminal Courts.